Hello Left Hand Creek Community! Below is our LWOG’s first update on the Captain Jack Mine Investigation. Article here. CDPHE changed operations in May 2018 to close a valve in the bulkhead at Captain Jack Mine and begin an experimental in-tunnel treatment system. After closing, they had a quicker than expected rise in mine pool elevation and lags in getting timely data. As a result, they decided to partially reopen the valve on 9/6/18 and have been releasing 25-40 gpm (gallons per minute). The CDPHE confirms that this is well below the historic discharge flow rates from the tunnel. CDPHE and EPA are currently processing data collected this week and making plans to add alkalinity to the sediment ponds onsite to encourage metals precipitation within those ponds. The Left Hand Water District provides water to 20,000 users in the district and operates the Haldi intake on Left Hand Creek, 15 miles downstream of the Captain Jack site. The District observed a slight drop in pH on 9/10/2018 (from ~7.0 to ~ 6.8) which was not considered acidic. Lefthand Watershed Oversight Group also conducted metals sampling at the Haldi intake on 9/26/18 and showed no change from baseline levels. Fish kills were observed by landowners in Left Hand Canyon for about a month. We have documented reports of dead fish observed from as far down to the confluence with James Creek. Up to a dozen dead fish were noted to be dead in single pool. The total numbers of dead fish are still to be determined. Fish are still present in the creek and do not appear to be actively dying anymore. 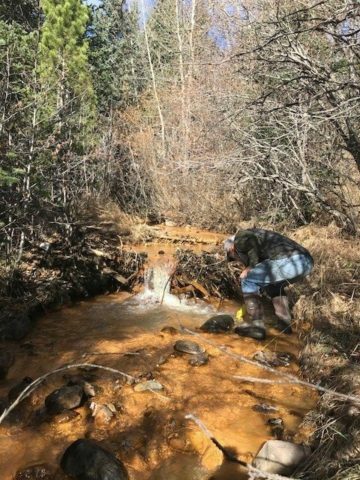 Yesterday, our staff conducted fish population sampling at four sites in the watershed, including areas approximately one mile downstream of the Captain Jack mine. Over a hundred healthy, live, brown trout were identified at lower reaches near the Haldi Intake and one dozen brook and rainbow trout were identified at upstream sites. My name is Amy Hardy and I live just below the town of Ward, though our property is in the Town limits. We are above the Captain Jack mine though Indiana Creek runs through our acreage. I am writing to you to see if anyone has noticed the encampments of people living illegally along Lefthand Creek between mile marker 13 and 15? I have photos of these folks with makeshift toilets right along the creek edge. There is a yurt, a dome, and a shed inhabited just feet away from the creek with no legal septic solution. The houses on the north side of the creek pull water out of the creek via hose to fill cisterns etc. Farther up the creek there are numerous less structured inhabitants living in tents. trailers and campers also with makeshift toilets right next to the creek. I have complained to Boulder County to no avail. Though it doesn’t seem like the latest contamination is due to human bacteria, I am surprised these practices are not looked at more closely.